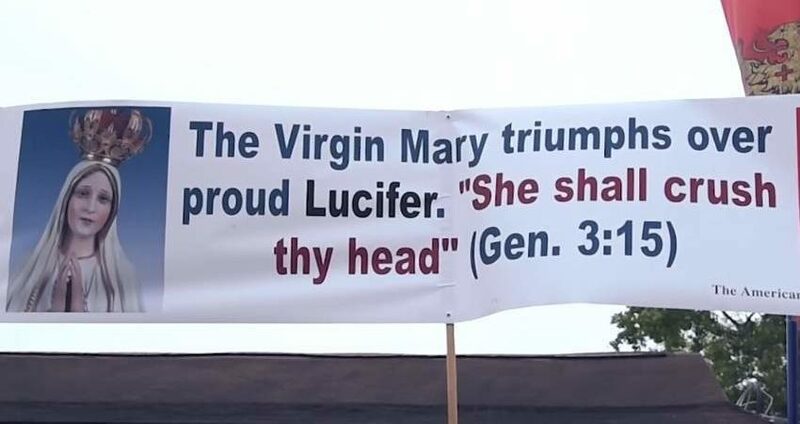 The outcome of their protest was unknown when Catholics gathered to oppose the opening of a "Church" of Lucifer in Old Town Spring, Texas. That prayerful protest was held in 2015. The "Church" of Lucifer is now CLOSED. At the end of October, 2015, members of TFP Student Action gathered with local friends and supporters to pray the rosary and successfully protest the founding of the Greater “Church” of Lucifer in the small upscale town. Old Town Spring is known a trendy shopping area for families living in the Houston area. With the arrival of the Luciferians, however, things changed. Local merchants were alarmed by the satanic intrusion. Families no longer wanted to bring their children near the town. Residents feared the dark influence of a “church” dedicated to the father of lies and saw it as part of a pilot program to mainstream Satanism in America. As the word spread, opposition grew. Prayer vigils and peaceful protests were organized. Locals voiced their concern. Families took a stand. Thousands of protest petitions were collected. Others, however, claimed that any effort to oppose public Satanism would be useless and preferred to adopt a let-things-be attitude. They wanted to give the “church” of Lucifer on Main Street the "right" to remain open. But the persistent prayers and the faithful voice of those who cherish America as "One Nation Under God" finally prevailed. The followers of the “Church” of Lucifer abandoned the property. “For Rent” signs are up. And the owners are fixing up the property -- hopefully for better purposes. Lesson learned: Protests work. And prayers are answered. Here's a video of the TFP protest in Texas.